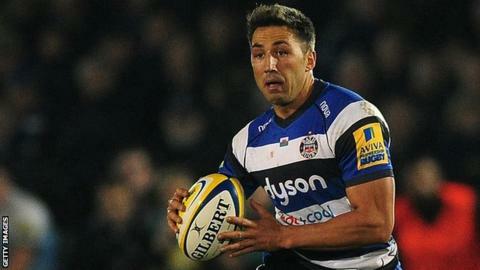 Wales international Gavin Henson will have a point to prove at new club Bristol, says their coach Sean Holley. Utility back Henson, 32, will join Bristol from Bath at the end of the season on a one-year deal. And Holley, who coached Henson at Ospreys, believes the double Grand Slam winner could revive his career with the current Championship leaders. "He has some points to prove. I think we've got a pretty good animal," said Holley. "I think he's got back to a little bit of his old self. "Gavin's opportunities have been limited. He's hungry to play rugby. I look forward to getting together with him again. "He's still got a couple of years left in him. I'm pretty sure Gavin is going to give his all and prove a few points when he gets the Bristol shirt on." Henson arrived at Bath from London Welsh in the summer of 2013 and has made 15 starts as well as 19 appearances from the bench. The former Ospreys, Toulon and Cardiff Blues man last played for Wales in 2011, but Holley has not ruled out an international recall for Henson. "You have to ask [Wales coach] Warren Gatland that," Holley added. "That's certainly something I haven't discussed with him. It's never very far away for Gavin Henson, is it? "He needs to be playing rugby before that can be anywhere near considered. "You never say never in rugby. The playing age is going up, the longevity of a player is going up."